The Coyote track & field team left the Jack Johnson Classic in Minneapolis on Saturday with two new records and eight champions. Senior Lara Bowman broke her school record for weight throw that she set last week by four feet, launching the weight 70-5. The mark placed her as the top collegiate finisher at the meet and moved her into 11th in the NCAA. Senior Megan Billington also broke a record she had previously set, this time the meet record for the 5,000-meter run. Billington clocked 16 minutes and 48.62 seconds, lapping the entire field and successfully defending her title from last year’s meet. Sophomore Abby Ripperda captured third place with a time of 17 minutes and 37.60 seconds. This is the seventh year in a row a Coyote has won the 5,000 meters at the Jack Johnson, according to GoYotes. USD swept the men’s high jump, taking the top three spots. Freshman Jack Durst and junior Zack Anderson both cleared 7-0 ¼, however, Durst cleared the height on his first attempt, giving him the title. Durst and Anderson now both sit in the top-30 nationally, Anderson at ninth and Durst at 29th. Sophomore Travis Larson captured third place at 6-9 ¾ . 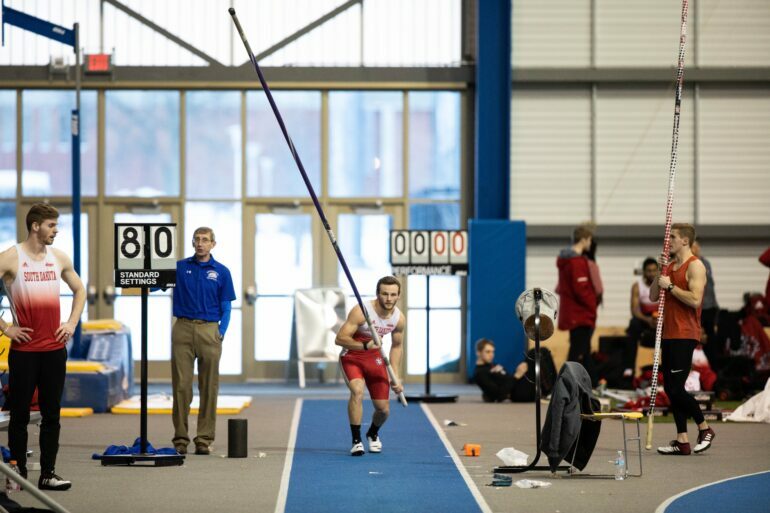 Junior Chris Nilsen won the men’s pole vault by clearing 18-8 ¾, while fellow junior Nick Johnson placed second with a height of 16-10 ¼. Junior Helen Falda captured the women’s pole vault title, clearing 14-2. Senior Eldon Warner won two events over the weekend, winning the mile with a season-best time of 4:09.05 and the 800-meter with a time of 1:55.88. Sophomore Macy Heinz placed first in the 800-meter, clocking in at 2:13.99, coming in less than a second shy of her indoor best. Junior Ellie Wilson won the 600-meter in 1:36.68.